During March 2018 Jermin Productions produced an educational, interactive and FUN in-house production which not only included but enforced key Fire Safety messages. We worked alongside the Mid and West Wales Fire Service to help launch their to Theatre In Education tour focussing on the dangers and hazards of fires and in particular, grass fires. This was our second TIE Tour with the Mid and West Wales Fire Service after helping to launch their ‘Be A H.E.R.O’ campaign in June 2017. From 11th-26th March 2018, we visited over 20 Primary Schools to exclusively deliver this education message to over 1,500 school children aged 8 – 11 years old. Working with the team at MAWW Fire and Rescue allowed us to target key schools and make a real difference to the younger generation in Neath, Port Talbot and the wider community. These school assemblies were exclusive to each school and the script was personalised to suit each school, area and highlighted the anti-social behaviour which occurs within their local community. This meant that the children were engaged in a piece of theatre specific to their lives and their neighbourhoods. For this project, Jermin Productions wrote a script to include all of the key information provided by the Mid and West Wales Fire Service, devised the piece into a highly interactive and animated performance and personally trained actors to deliver this funny yet informative performance to schools all across Wales over the period of two weeks. Over the course of two weeks we visited each school to provide them with their very own ‘Pop Up Panto’ which allowed the children to experience the magic and excitement of live theatre whilst still being in a learning environment. Together with the Mid and West Wales Fire Service we delivered this piece through both the welsh and english language. What are the advantages of Theatre In Education? • Theatre in Education tours are extremely effective and invite each and every child to join in with the action and be a part of something whilst still learning those all important key messages. • This welcoming and interactive environment allows every single child to contribute something to the piece regardless of their ability or age. • Through songs, rhymes and rhythms we can encourage students to learn important facts and information without them even realising making learning as fun and easy as possible. • The experience is FUN! The children enjoy their time at the assembly and WANT to learn and ENJOY learning. • For children who aren’t extremely academic, this is an opportunity for them to learn at the same speed as everyone else in the room. • Our welsh performances introduce children to new vocabulary in a storytelling setting making it easier for them to learn, retain and recite these new words and sayings. • Theatre In Education builds children’s confidence and encourages to shout out, sing and volunteer to be apart of the action. • Our tours allow students to meet and interact with real firefighters and police men and gives them an opportunity to ask them questions during our Q&A session. 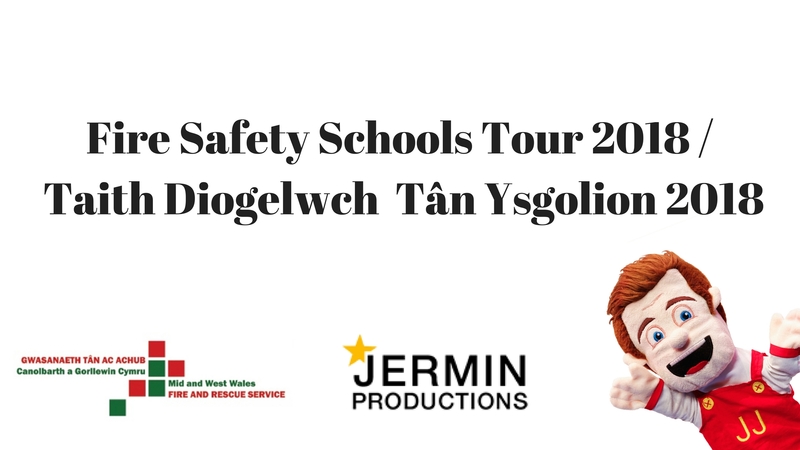 If you are interested in having a cast or character visit your school or organisation, or would like to team up with Jermin Productions to produce a schools tour please email enquiries@jerminproductions.co.uk.